This is a very simple pattern for a football. This was a request from a co-worker. The one that I made him had the Tampa Bay Buccaneers logo sewn to it. Worsted weight yarn: coffee and white. Rd 12: sc in each sc around. (45) Change to white. Rds 13-14: sc in each sc around. (45) Change to coffee after Rd 14. Rds 15-26: sc in each sc around. (45) Change to white after Rd 26. Rds 27-28: sc in each sc around. (45) Change to coffee after Rd 28. 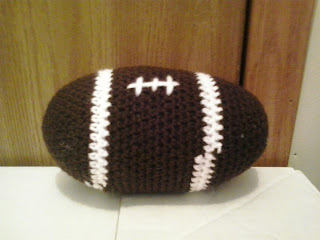 WITH DOUBLE STRAND OF WHITE, EMBROIDER LACES ON FOOTBALL. BEGIN STUFFING FOOTBALL FIRMLY. 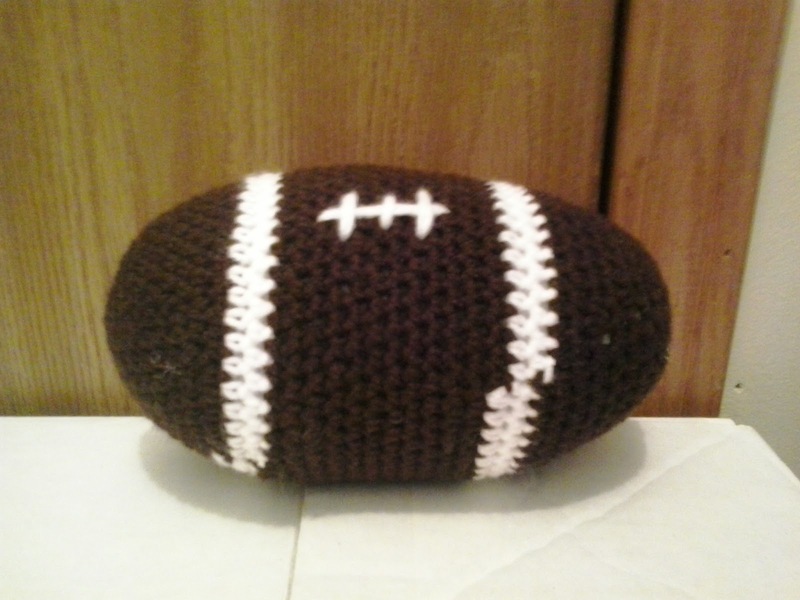 CONTINUE STUFFING FOOTBALL FIRMLY AS YOU GO ALONG. Finish off leaving a long tail. Weave tail through sc of Rd 39, pull tightly, and secure. Weave in ends.